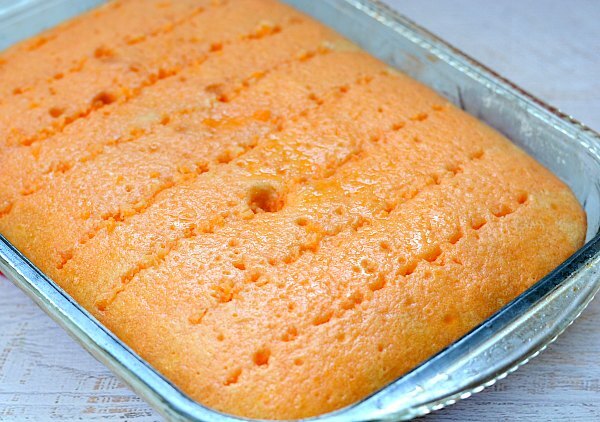 Gather the kids and make this fun pumpkin patch orange poke cake with a boxed cake mix and Fanta Orange. 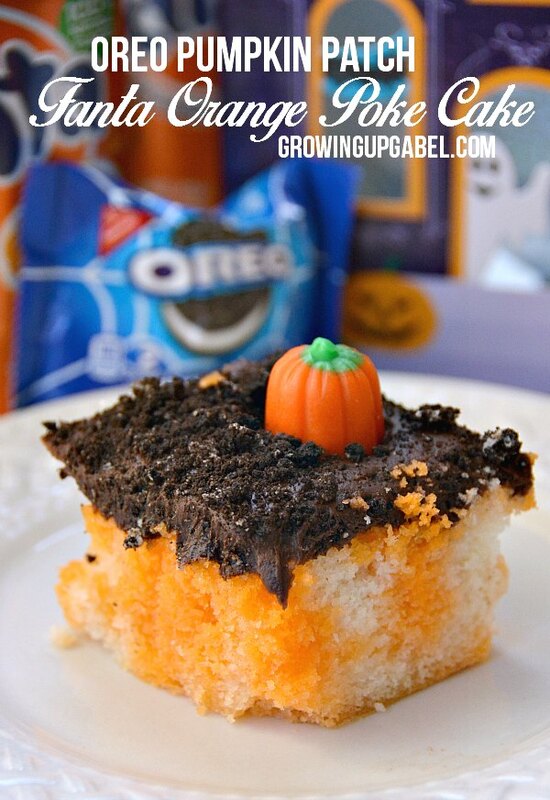 Top with frosting, OREO cookie dirt crumbs and candy pumpkins for a fun Halloween treat! My kids have always loved Halloween way more than me. It was always a one day event when I was growing up, but now it's a regular month long celebration. 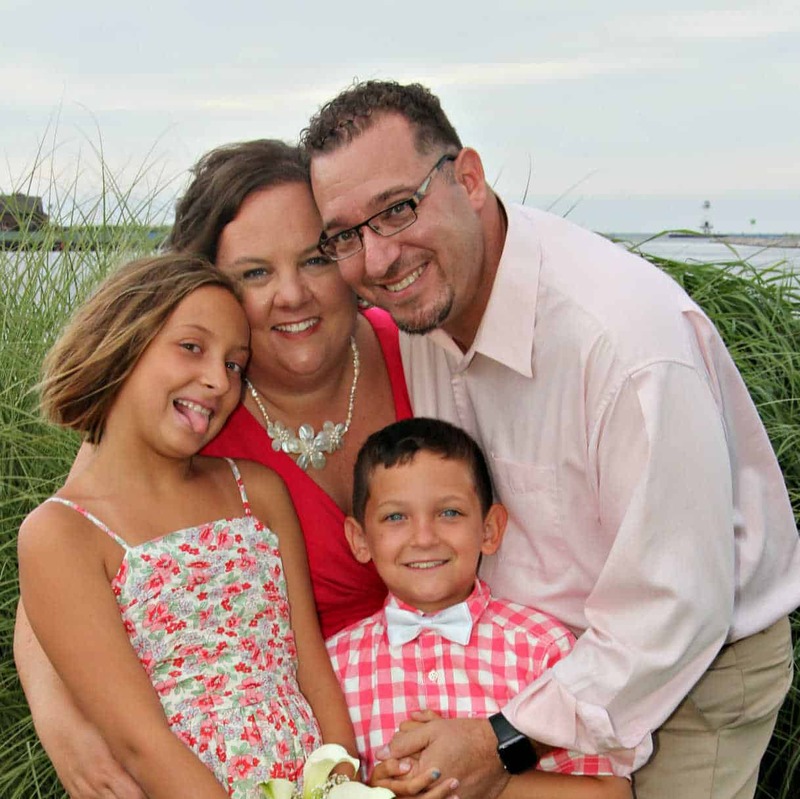 I've had a lot of fun embracing the pumpkins and cute ghosts that come along Halloween and having fun with my kids. 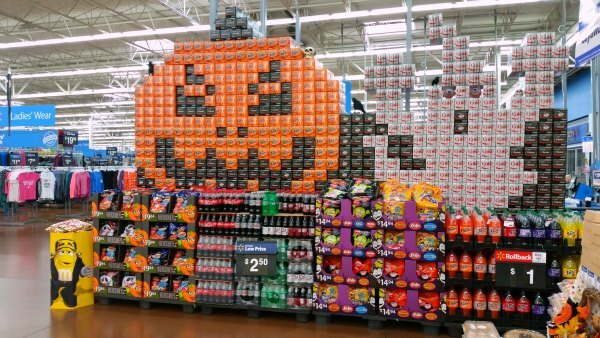 So when I walk in to Walmart in October and the first thing I see is this awesome display, I have to buy something to create a fun Halloween treat for the kids. Someday I want to be in the store when they are building one of these. I snagged a case of Fanta Orange soda with an idea brewing for a cake. 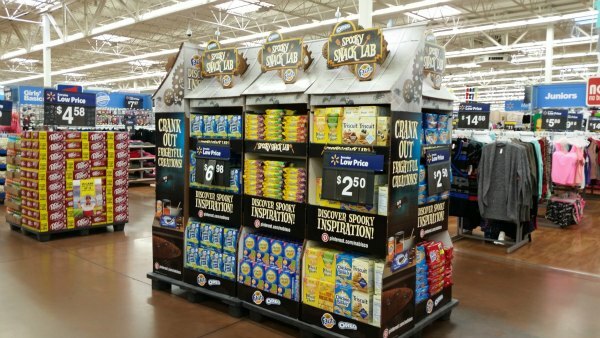 A little further down the aisle, I ran in to the Spooky Snack Lab display complete with a box of Glow in the Dark OREOs! We love OREOs around here and I know glow in the dark ones would be a big hit. 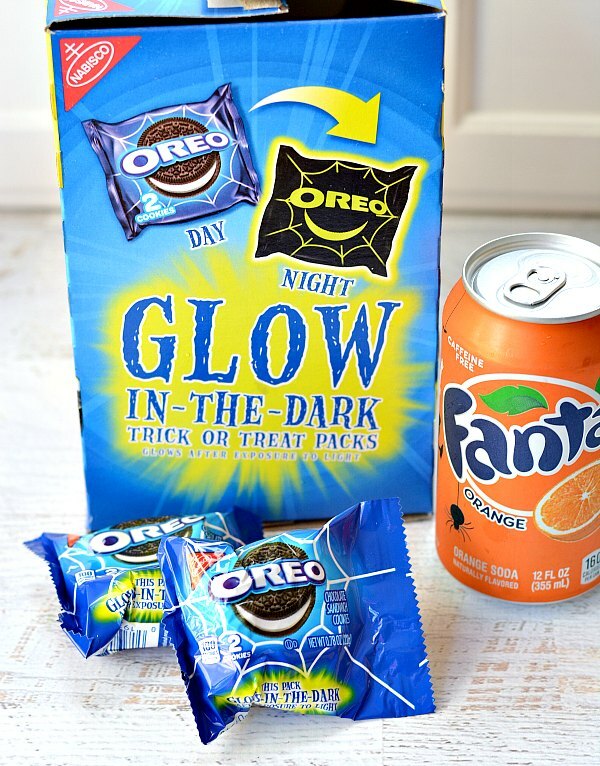 Seriously how cool are those OREO packages that glow in the dark?! Perfect for trick or treaters, but I wanted to make a little treat with them, too. 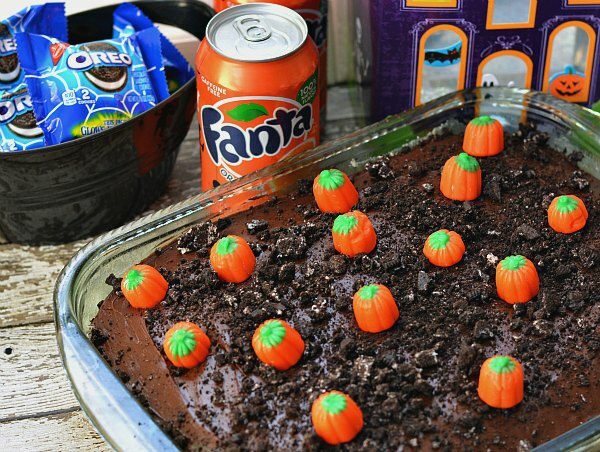 Last year one of our favorite Halloween desserts was a Pumpkin Patch Dirt Cake so this year I used the Fanta and OREOs to make a Pumpkin Patch Poke Cake. This was my first poke cake ever and they are so fun to make! Start with any white cake. You can make one from a box mix or from scratch. The signature of a poke cake is of course the fun flavored gelatin. I used Fanta to make the orange gelatin flavor pop. I checked about 30 different poke cake recipes, and yes, you pour ALL the gelatin mixture over the cake. I had some serious doubts, but it worked. 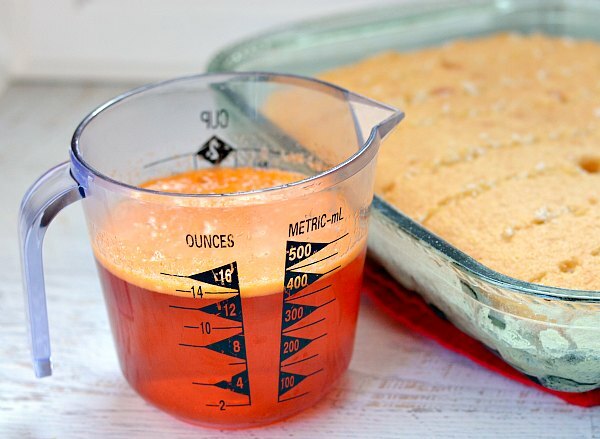 The cake needs to chill for at least 3 hours after you pour the orange mix over it. I let mine chill for 24 hours and it was fine. Once the cake is chilled, frost with chocolate frosting. I chose chocolate because I was going for a dirt look, but vanilla would work, too. Then, use a rolling pin to crush the OREOs inside of the glow in the dark packaging. I used 3 packages, or 6 cookies. 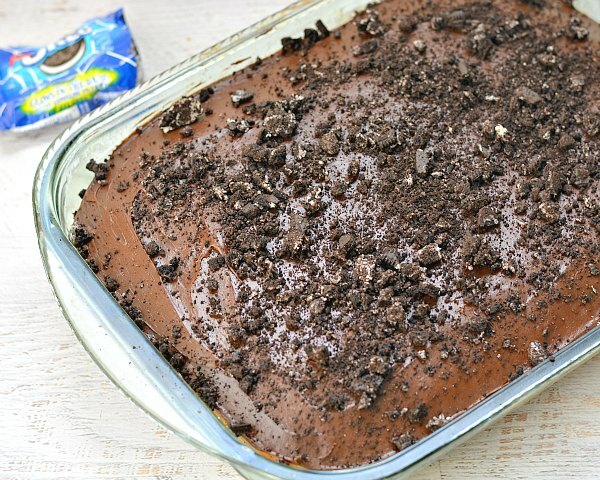 Sprinkle the OREO crumbs on top of the chocolate frosting. Finally add your pumpkins to the patch. I just randomly put them on and pushed them down a little in to the frosting and cake. Slice up and serve! I love the how the orange color just makes this cake pop. The Fanta added so much flavor to the orange part of the cake. Orange and chocolate happen to be one of my favorite flavor combinations and they worked perfectly in this fun pumpkin patch poke cake. Prepare white cake according to directions on the box or recipe. Remove from oven after baking and allow to cool for 15 minutes. Use a large fork or bamboo skewer to poke holes about 1/2" inch apart in the cake. While the cake is cooling, bring 1 cup water to a boil in a small pot. When the water is boiling, remove from heat and carefully stir in the orange gelatin. Add 1/2 cup cold Fanta to the gelatin mixture and stir to combine. The liquid will foam up when the Fanta is added so pour slowly. Carefully pour the entire orange mixture in to the holes and over the cake. Cover and refrigerate for at least 3 hours. When ready to decorate, remove the cake from the fridge. Spread the chocolate frosting on top of the cake. Use a rolling pin to carefully crush the OREO cookies in their packs. Sprinkle the crushed cookies on top of the chocolate frosting. 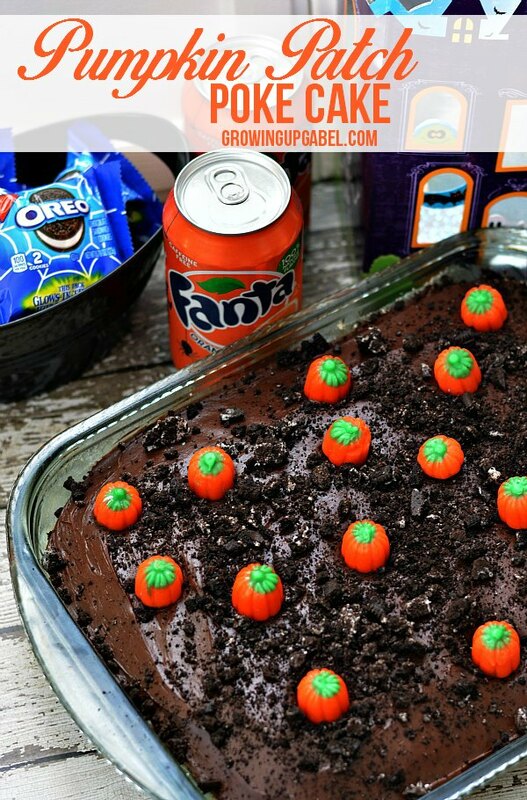 Place the pumpkin candies on top of the frosting to create a pumpkin patch. 7 Reasons to Go to Chuck E. Cheese's Tonight! Oreo’s & Fanta?? What a fun cake! I totally want to eat that! Camille, this is so cool! I would love to make this with my grandbabies!! Thanks for sharing with us at Throwback Thursday! What a great combination. Thanks for sharing with us at Throwback Thursday. Pinned and Shared! Poke Cake is always fun – love your seasonal twist on it! Hi Camille! I have printed out your recipe and plan to make your yummy cake to take to work for my co-workers (and ME of course). I am going to check out your dirt cake also. Thanks for sharing your recipes. 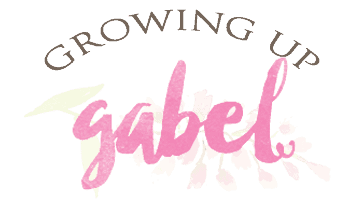 I saw your post over at DIY by Design’s blog party. I’m hooked now! So many possibilities!